Nobody visiting Soif would ever wonder what manner of place it is given that the room is entirely framed in cork and the walls are plastered with maps of wine regions. 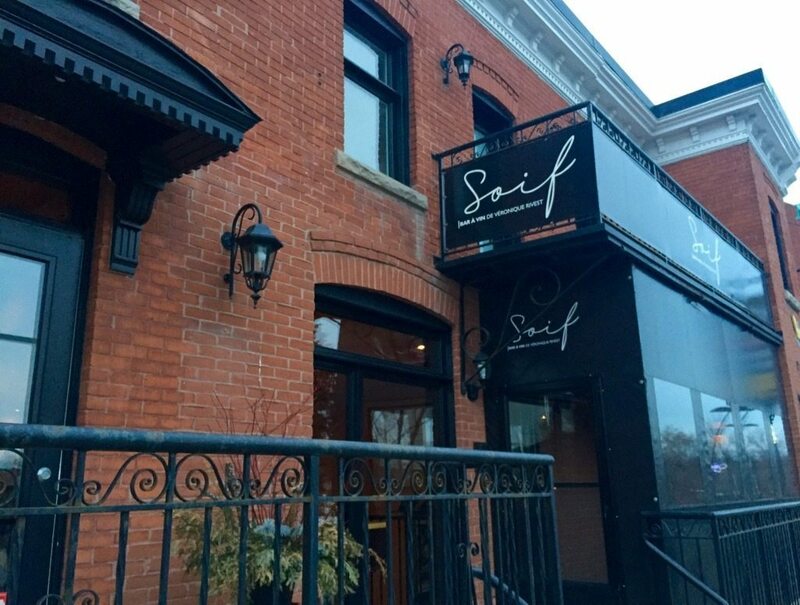 Since my first tastes of sommelier Véronique Rivest’s wine bar in late 2014 (when it was pretty new), the kitchen has steadied under a new boss. Best known for the eight years he worked in the pint-sized kitchen at Oz Kafé, Jamie Stunt’s approach to food at Oz was to take humble (or out there) ingredients (yak, for example) and make them hum. His dishes were an eclectic bunch, but all with sense of place and all with proper ballsy flavours. But I wouldn’t suggest any of his Oz dishes was designed with a wine list in mind. And I would think beer was more his drink (he paired his Gold Medal Plates winning dish with an Ashton Brewing Company ale) and during the Canadian Culinary Championship of 2013, he admitted his wine knowledge was wobbly. (Though it didn’t stop him from securing second place.) So I did wonder how well Stunt and Soif would get along. The menu offers a dozen small plates, plus three sharing boards – charcuterie, vegetables, cheese – and a couple of good things on grilled bread (the Soif smoked trout, lubricated with a smear of crème fraiche and topped with fried capers, is excellent.) These are not the usual suspect small plates: beets come fried with a sauce Gribiche or in a salad brightened with yogurt, mint and the sweet burst of pomegranate seeds; poutine gets smothered with boudin noir and fried sage; duck hearts are grilled and brushed with a sweet-spicy punch; a rice wrap comes with an anchovy dip; grilled broccoli with a gouda cheese sauce; oysters are a constant. 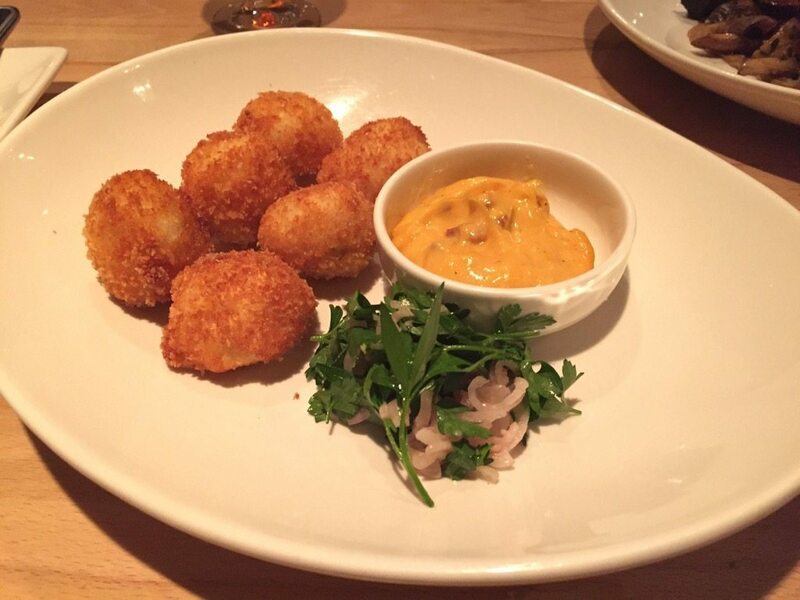 We began one night with a lovely Crémant de Bourgogne and a plate of salt cod fritters, the bubbles working off the fat and the salt like they never happened. The fritters were terrific – the fish milked of its saltiness, smoothed with potato, puffy and soft within their brown panko wrappers. They came with a mayo, punched up with chorizo, and, for acidic relief, a citrus-sparkly parsley salad studded with chewy bits of bacon and strands of pickled onion. On another night, we repeated the theme — the fritters replaced with fried perch sticks, served with a celery root rémoulade. Boudin noir (black pudding/blood sausage) came in a dark tart, the forceful flavours softened with an earthy celery root purée and sweet onions cooked down so long and slow they’d become a deeply delicious paste. A cranberry relish lent some fruity-tart, and a watercress salad some green relief. This could have been diner for me — and a steal at 15 bucks. 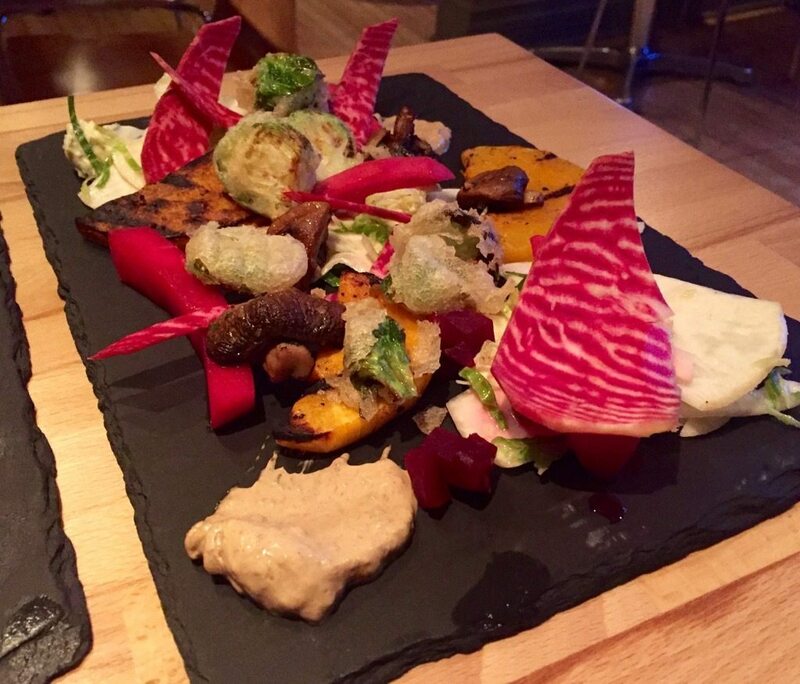 Another visit we worked our way pleasurably through the vegetable board, a black slate covered with raw chips, pickled beets and radish, grilled squash, tempura-ed Brussels, served with a black garlic mayonnaise. 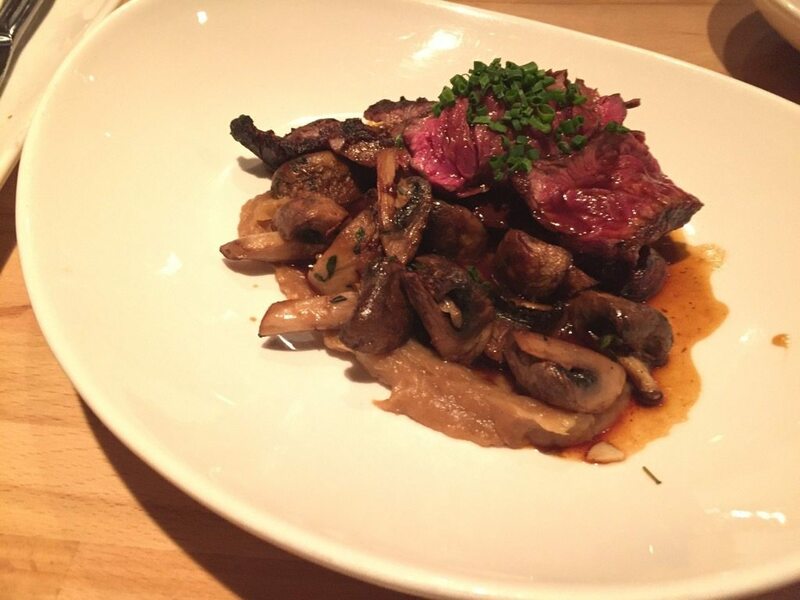 And then feeling virtuous, we ordered the hanger steak, the meat chewy and rare, sliced on a bed of roasted mushrooms and potatoes, moistened with a dark, clean jus and served with a generous smear of onion jam. I didn’t take a shine to a couple of the wines I was offered at my visit, but I liked very much two things about the experience of not liking them. One, that I had the choice not to like them – samples are always offered. And two, the server knew her wines, but was utterly approachable. I felt in no way pressured to like her recommendations. Her mission was to find me one I did. My husband — a far less complicated creature — was delighted with his Petit Trio, three 2-oz pours of South American reds. 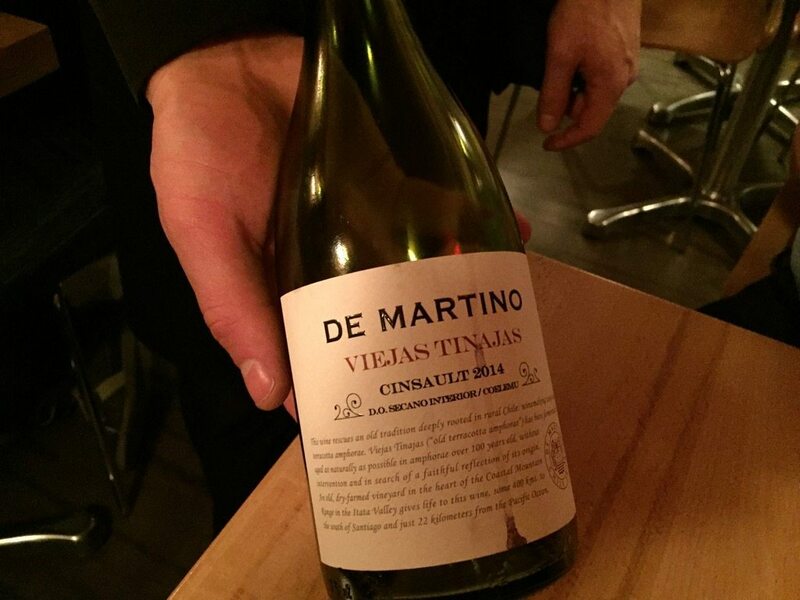 He committed to the 2014 De Martino Viejas Tinajas Cinsault, a light Chilean red, which took him happily through his meal. There were two desserts on offer, including a maple pie — the sweetness cut with blue cheese — and a dark chocolate and salted caramel mouse topped with brioche crisps that was extremely edible. 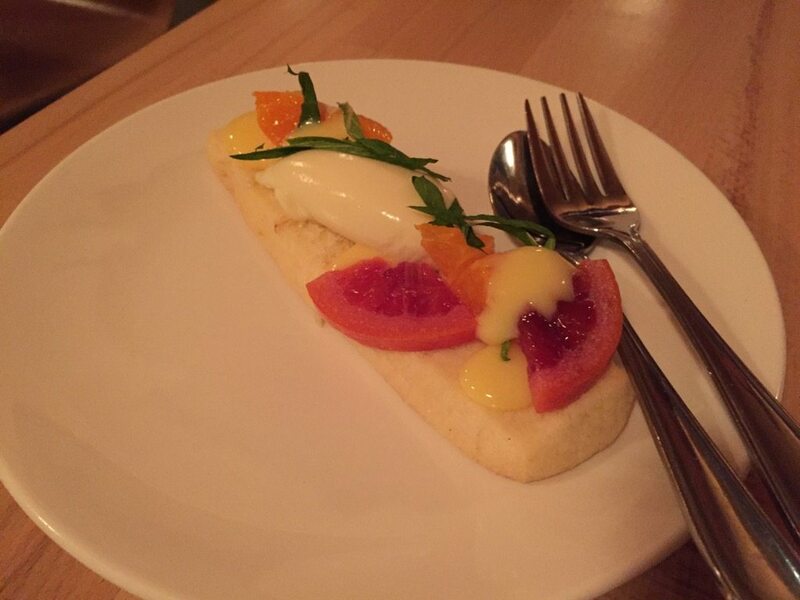 During another visit, stuffed with boudin and bison, we opted for the deconstructed citrus tart, its base a bar of buttery shortcrust, topped with curd and cream, candied orange and a chiffonade of mint. Lovely.